The present building is a commercial-office building located in a rectangular site which has approximately 15 meters of frontage along the west side of Vali Asr Avenue between Fatemi and Zartosht junctions. Here is the hub of different activities in Tehran and innumerable shops and restaurants as well as large cultural centers are situated along this avenue. Neighbors of our site are an old 6-storey building in the north and a ruin one-storey one in the south .Based on municipality codes we could have just a two-storey structure in this location, thus there was no possibility to make balance in elevation with adjoining buildings. 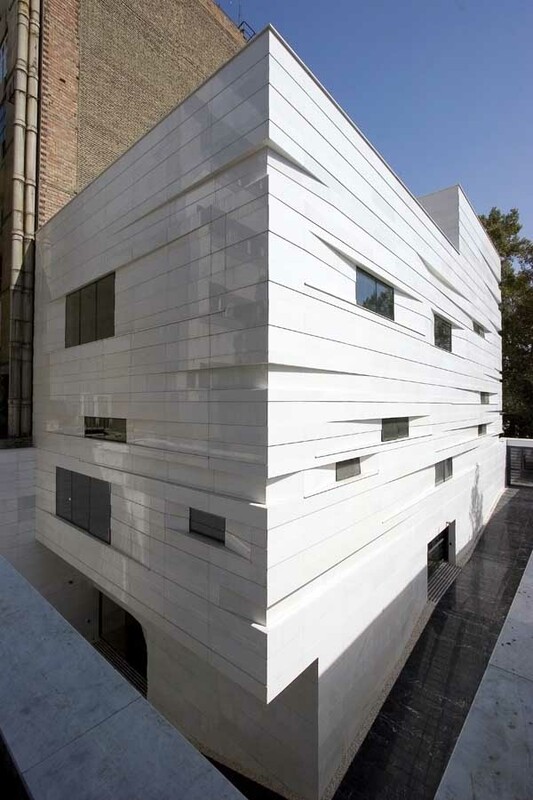 Considering the facade as a city skin, we intended to bring motion and dynamism which exist in location into the skin of our project, as if skin is influenced by people motions .Moreover facade as a continuous skin which is not smashed by different materials was our main objective. We just slashed the skin of the main surface for the openings and then pulled it towards other facades and also inside to make integrity in both outside and inside. The diagram was finally chosen shows how by means of surfaces, different spaces transfigure and connect into each other to create overall integrity. This unity could be experienced by walking through the main passages in between spaces. The foundation consists of reinforced concrete footings and foundation walls. The construction components include a masonry and fireproof steel frame structure with steel beams. Mechanical system comprises ceiling-mounted fan coil units in each floor with the condenser unit on the roof. The building mostly finished by a contrast of black & white longitudinally cut-stones in which, facade roles the white face by wearing the very special Brazilian marble with the least colored grains and in opposition, floor finished by the black Nadjafabad marble. All the facade stones firstly cut into the desired dimension as drawings (so there was no need for cutting the stone in place), and then scoped to the wall. 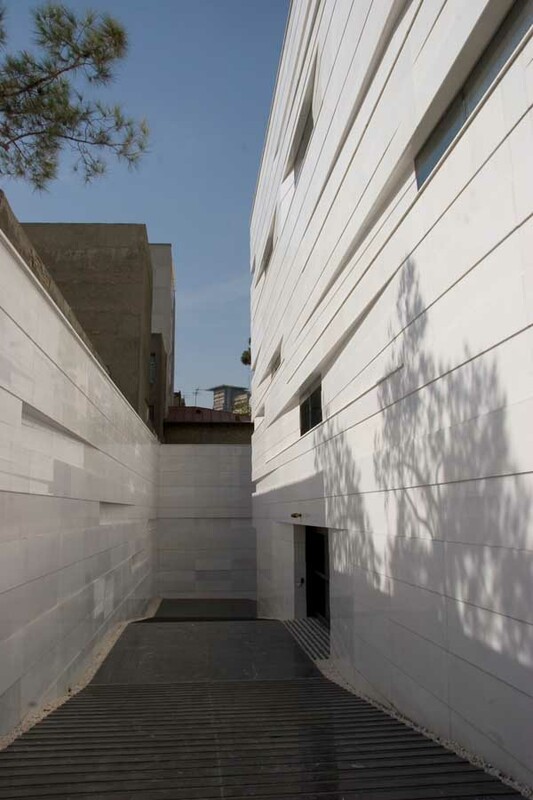 Due to the facade form which influenced the both side of the wall, it was necessary to have a steel-base false wall, which was filled with plastofoam as thermal insulation layer.